In this richly illustrated book, art historian John R. Clarke helps us see the ancient Roman house "with Roman eyes." Clarke presents a range of houses, from tenements to villas, and shows us how enduring patterns of Roman wall decoration tellingly bear the cultural, religious, and social imprints of the people who lived with them. 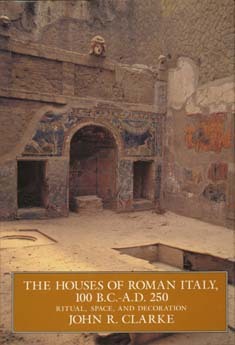 In case studies of seventeen excavated houses, Clarke guides us through four centuries of Roman wall painting, mosaic, and stucco decoration, from the period of the "Four Styles" (100 B.C. to A.D. 79) to the mid- third century. The First Style Samnite House shows its debt to public architecture in its clear integration of public and private spaces. The Villa of Oplontis asserts the extravagant social and cultural climate of the Second Style. Gemlike Third-Style rooms from the House of Lucretius Fronto reflect the refinement and elegance of Augustan tastes. The Vettii brothers' social climbing helps explain the overburdened Fourth-Style decoration of their famous house. And evidence of remodelling leads Clarke to conclude that the House of Jupiter and Ganymede became a gay hotel in the second century. In his emphasis on social and spiritual dimensions, Clarke offers a contribution to Roman art and architectural history that is both original and accessible to the general reader. The book's superb photographs not only support the author's findings but help to preserve an ancient legacy that is fast succumbing to modern deterioration resulting from pollution and vandalism. John R. Clarke is Annie Laurie Howard Regents Professor, History of Art, at the University of Texas, Austin.